While watching the riveting BBC coverage of the Open Championship at St. Andrews today I was reminded of the importance of the caddie to tournament players. At the amateur level we tend to think of caddies as bag carriers who may occasionally give us a second opinion on a line of putt, but at the tour professional level their duties are far more widespread. As a Rules blogger I don’t intend to expand on caddies’ skills as organisers, equipment managers, psychologists, meteorologists, surveyors, lackeys, swing coaches and greens readers. Instead, I want to pick-up on a conversation between the two ‘bad boys’ of the 1979 GB and Ireland Ryder Cup team, Ken Brown and Mark James. When the player's ball is on the putting green, the player, his partner or either of their caddies may, before but not during the stroke, point out a line for putting, but in so doing the putting green must not be touched. A mark must not be placed anywhere to indicate a line for putting. The last sentence also explains why a caddie, or anyone attending a flagstick, may not touch the putting green with the end of a flagstick (or anything else) to point out the line of putt. You are permitted to point out a line providing you do not actually touch the surface of the putting green. Decision 8-2b/2 explains the situation in more detail. Q. A player's ball lies on the putting green and his caddie attends the flagstick for him. The caddie suggests, before the stroke, that the player aim at the caddie's left foot. Is the player in breach of Rule 8-2b? A. If the caddie had placed his foot in position for the purpose of pointing out the line for putting, the player was in breach of Rule 8-2b as soon as the caddie placed his foot in that position. The breach could not be corrected by the caddie subsequently moving his foot. If the caddie did not initially place his foot in such a position for the purpose of pointing out the line for putting but subsequently suggested the player aim at his left foot, the player would be in breach of Rule 8-2b if the caddie did not move that foot to another position that does not indicate a line for putting prior to the stroke. The same answer would apply if a player's partner attends the flagstick for him. So, the implication from Mark James was that even if there is a prior agreement between a player and his caddie, e.g. that he will always position his right foot at the point that they have settled on as being the right line for the putt, it would be difficult to penalise the player for the breach if no words had been exchanged at the hole. Is this against the Rules? Strictly speaking, yes, but almost impossible to enforce. 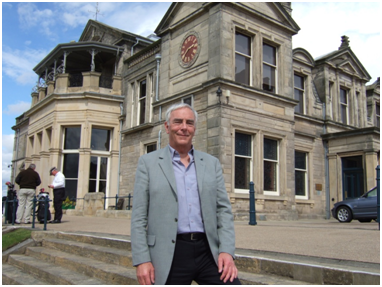 Watching the wonderful coverage at St. Andrews has reminded me of my visit there last year when Andy Brown interviewed me about the history of the Rules and the fact that they are unified across the world. Click here if you haven’t already seen this short video. Finally, do you remember my blog on slow play a few weeks ago where I commented about the target time of 3 hours and 57 minutes laid down for players at the Old Course, St. Andrews? Well, I received a communication from a correspondent friend of mine, who has long been a Rules Official in Canada, stating that in the 2005 Open Championship at the same venue it was taking groups around five hours to complete their rounds. Coincidentally, he was in Dublin two weeks ago at the start of his vacation and we had an enjoyable four-ball at my Club with both our wives. He told me that after touring Ireland they were moving on to Scotland to enjoy The Open and play more golf there. I have just received an email from him and he confirmed that the very first group that played on Thursday, in benign conditions, took 4 hours and 24 minutes and the last group that they watched took a ridiculous 5 hours and 11 minutes, with 11 more groups still to finish. I can think of no reason why Tour Professionals with caddies, taking an average of only 72 strokes per round, should take over an hour longer than amateur players, who take an average of at least one more stroke per hole. Slow play is a significant threat to the growth of golf. Fewer and fewer people are able to justify spending five hours on the golf course in addition to the travelling, changing, showering and social time that are essential parts of the golfing experience for many of us. We can, and should, all do our bit to speed up play. P.S. As I post this blog the R&A has just suspended play at the Open because the strong winds are moving the balls, especially at the 8th to 12th holes. Click here to see my blog, "When the Wind Moves Your Ball in Play". If you would like to receive notification of my blogs please enter your email address in the top right hand corner of my home page where it says “Subscribe via email”. There is no charge and I promise that your contact details will not be passed-on to anyone else. Of course, you can unsubscribe at any time. Terrific post, Barry. Thanks. Sadly, it just adds to the list of friendly cheating that goes on during a charity scramble where one member of the group actually announces that one foot or the other is the target line. Personally, I would be willing to celebrate that breach of the rules if these things didn't take 6 hours to play. What are your thoughts on the excuse I always hear for the pro's slow play. They fall back on the excuse that the pros are playing for so much money and tour position that it is acceptable for them to play 5 1/2 to 6 hour rounds. I don't accept that excuse at all. I would argue that golf pros should be setting the example for the millions that follow them and help support them in their chosen profession. I'll give you one example that is relevant to my area of expertise. If they spent a little more time off the course learning more about the Rules they would not have to delay their rounds by seeking so many rulings, many of which seem spurious. Glad to hear you say that. I agree wholeheartedly. I can sort of understand the fear of making a mistake with a rule when there is an official close by instead of calling one of the other players to confirm a ruling. My pet peeve is the influence of sports psychologists and these "rain delay" preshot routines and not being ready to start a shot when the other guy is done. A lot of players won't even pull a yardage book until the other ball stops. What happened to the time rules ? Wasn't there a rule that stipulated a certain number of seconds for each player to make their shot after the first player's ball came to rest ? Are they still on the books ? There is nothing in the Rules of Golf dictating how quickly a player should make their stroke. Rule 6-7 states, "The player must play without undue delay and in accordance with any pace of play guidelines that the Committee may establish." However, the USGA did publish a 'Pace of Play Policy' in July 2003, which included this sentence, "When a group/match is being monitored and timed each player in the group/match is expected to play any stroke within 40 seconds after timing of the player's stroke begins." This document can be viewed on the USGA.org web site under Rules, Competition Guidelines, Pace of Play Policy. THAT'S IT ! I had a feeling you'd know what the heck I was talking about. On the putting/caddie assistance,what are your thought's on Robert Rock's caddie and the unusual style where as for most hole's he lies on his belly from behind the player just as the putt is being made? I have no problem with this procedure if the player thinks that it is helping him. Personally, I think that it would be more likely to put me off than assist me. Of course, the caddie must move away before the stroke is made, or the player will be penalised under Rule 14-2b. Now there's a rule I'd like to see changed, at least as a professional tour exception. I can't believe that caddies are allowed to align a professional golfer to their line. These are supposed to be the best in the world, but they can't set up to their ball and target without help ? Come on. Hi Barry, A player has lost his ball in an area of rough and his caddy is seen dropping a ball and claiming that he has "found" the ball. It is immediately brought to the attention of the player. Should the player be disqualified from the tournament for the actions of his caddy? Yes, the player incurs the penalty of disqualification. A player incurs the applicable penalty for any breach of a Rule by his caddie (Rule 6-1). Can a caddy request his players opponent replay a shot when he plays out of turn.In a junior pennant match the opponet missed a putt and then tapped in from 12inches and caddy not player asked for shot to replayed. Ironically once others in group putted out the player conceed the 12inch putt anyway. No, a caddie does not have the authority to require that his player's opponent's putt be cancelled for playing out of turn. In my opinion this was extremely bad etiquette and the caddie should be admonished. The player was right to concede the opponent's putt second time round.